Capsule Summary: Margaret gets depressed and demands a transfer after receiving a letter from an old friend who married a doctor she turned down. It’s more or less universally agreed by M*A*S*H fans that “Hot Lips and Empty Arms” is the episode that starts the character of Hot Lips on the path to becoming Margaret. Her evolution continues throughout Season 5 (“Margaret’s Engagement,” “The Nurses,” “Margaret’s Marriage”) and into Season 6 (“In Love and War” and the two-part “Comrades in Arms”) and Season 7 when her marriage to Donald Penobscott ends. Margaret also makes her feelings for Hawkeye and Trapper very clear: she basically despises them and blames the pair for undermining her with her nurses. Yet she also apparently harbors feelings for Trapper (“That curly blond hair and that crooked smile. And you’re really built, too, you know, you son of a gun.”) as well as some regret for beginning a relationship with Frank. In other words, Margaret is conflicted on multiple levels, unhappy with her career and her personal life. She’s unable to open up to anyone about how she really feels unless she gets very, very drunk. The Army is supposed to provide the discipline and sense of order she craves but the 4077th is anything but ordered and disciplined. I don’t think it’s a flaw in the episode that Margaret never explains why she decides not to transfer away from the 4077th. Maybe it’s the incoming patients. 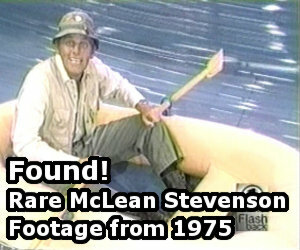 Maybe it’s Trapper. Maybe she’s too scared to leave a place she knows, a place that’s comfortable, for the unknown. There’s not much going on in “Hot Lips and Empty Arms” that doesn’t involve Margaret in some way. The minor subplot in which Henry orders an adult movie and watches it with Hawkeye and Trapper draws in Margaret. She calls it “the most vulgar, based thing” she’s ever seen. Later, he orders two more films from the Tobasco Film Company: “Paulina Paris and Her Pelican” and Francine Laflame and Her Tassles in the Air.” Poor Radar has to sign his name to the order form. Speaking of Radar, he’s seen drinking and smoking a cigar–two things the naive, innocent Radar of later seasons doesn’t do. 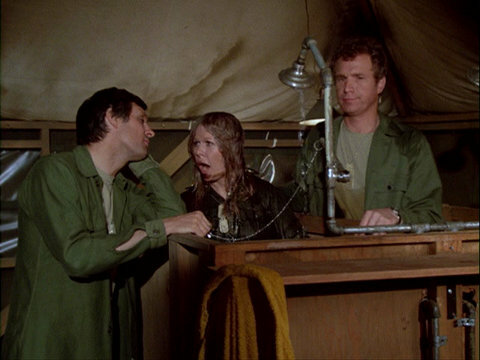 Hawkeye and Trapper try to sober up Margaret. Linda Bloodworth and Mary Kay Place were the first women to write for M*A*S*H. The pair went on to write “Springtime” and “Mad Dogs and Servicemen” (both Season 3). Linda Bloodworth later wrote “Soldier of the Month” (Season 4) and “The Nurses” (Season 5) on her own. Mary Kay Place also acted in “Springtime,” playing Lt. Louise Simmons. The shower scene in which Hawkeye and Trapper try to sober up Margaret was obviously the second (or third) take. Trapper’s shoulders are already wet before Margaret hugs him. I love the opening scene with Radar delivering mail. Watch it closely. First he gives a letter to Goldman, who is sitting in a jeep, then hands one to Voskowitz (played by an uncredited actor), who is standing next to a barrel fire. Voskowitz turns the letter over in his hands several times while Radar knocks on a door and walks into a tent. Radar comes out of the tent with a cracker or a cookie in his mouth. As he walks toward the camera, Voskowitz drops his letter in the fire. Was that scripted? It had to be scripted. No extra would burn a prop without permission, right? Next, Radar approaches a soldier (played by Dennis Troy) talking to Nurse Watson (the lovely Sheila Lauritsen). “Letter from your wife, sir,” Radar announces. The soldier takes the letter. Nurse Watson looks surprised and walks away. Radar then knocks on the Officers Latrine to deliver yet another letter. Of course he knows who’s in the latrine. He’s Radar. Is the scene in which Margaret returns some of Frank’s things usually cut in syndication? I don’t recall Bimbo the stuffed dog. Yes the whole scene in the Swamp with Bimbo is cut out in syndication. The syndicated version goes from the surgeons toasting Margaret to the scene where she staggers into Henry’s office. It’s a shame they cut the Bimbo scene because the part when Margaret calls Frank “ferret face” is one of the funniest parts. There’s a clip on YouTube of Loretta Swit speaking at a memorial for Wayne Rogers and she talks about how he was always the guy with “the curly blonde hair and crooked smile” to her and it became a running joke through the years. This is my favorite episode of the second season and definitely in the top 5 overall. As much as this is a pivotal episode for M*A*S*H for different reasons, such as marking the beginning of the development of Margaret’s character, as well as the first episode written by Linda Bloodworth & Mary Kay Place, the episode, as a whole, gets a “meh” from me. The only real highlight for me is drunk Margaret (“Why don’t you call me Henry, for Pete’s sake?” “That’s real swell of ya, Pete.”), but other than that, I really don’t find much of anything else about this episode that really sticks out for me. R.J. doesn’t say that Mary Kay Place was also the voice on a record of Radars girlfriend (I forget her name) in season 1s “LOVE STORY” and the voice on the radio in another episode (I forget what it’s called but it’s from season 2 or 3) when Fr. Mulllcahey is marring Klinger to Laverne Espozeto. To answer your queries , Radar’s girlfriend was Linda Sue and the episode you’re thinking of was “Springtime” from season 3. Mary Kay Place was not the voice of Radar’s girlfriend Linda Sue (heard on a record) in “Love Story.” That’s according to Larry Gelbart. I discussed this in my review of the episode, which you can find here. As for “Springtime,” I’ve never found confirmation that Mary Kay Place provided the voices on the radio. Margaret: I’d have loved him if I’d known. That line is both insightful and disquieting because it makes Margaret sound really shallow and materialistic. Aside from that, this is an OK episode. Margaret’s drunken antics come across as bizarre and a indicator of future events. I assume Hawkeye’s introduction of ” Lord and Ozzie Nelson” is a reference to the radio/TV versions of “The Adventures of Ozzie and Harriet”,but not being familiar with those productions I’m just guessing.